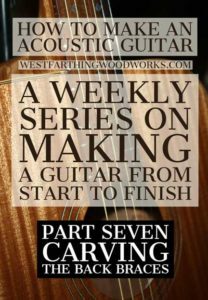 This is Part Seven of the How to Make an Acoustic Guitar Series featuring the Mahogany Guitar. 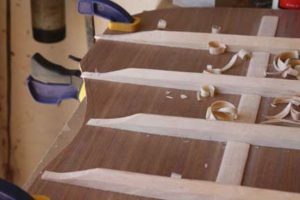 In this part of the series, I’ll show you how to carve the back braces, and several great tips along the way. Enjoy. After all of your braces of been glued down, and the glue is fully cured, which should take about 24 hours, you can start carving. Carving the braces is not nearly as difficult as it sounds, even for a beginner. 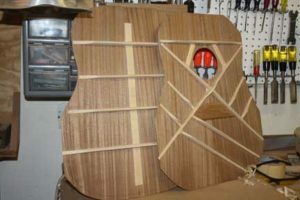 Many new guitar makers are a little bit intimidated by carving the braces at first, but after a little bit of experience the job gets a whole lot easier. The same thing will happen for you, and thankfully the back braces don’t require any type of elaborate carving. On most back plates, there are only four braces that run perpendicular to the center seam overlay which runs from the top to the bottom of the plate. This means you don’t have very much carving to do, and I’ll show you the exact process you need to be successful. 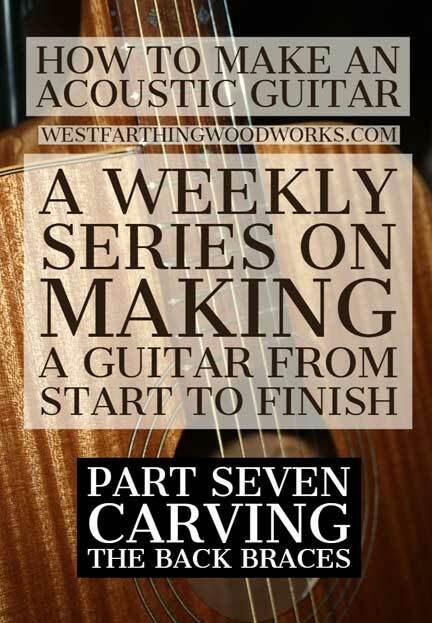 First, if you are an absolute beginner when it comes to carving guitar braces, I recommend that you practice in a consequence free environment. This means you do some practice before you actually carve the braces on your guitar. In order to make this practice effective, you need to set up the exercise in such a way that it’s very realistic and similar to the real thing. 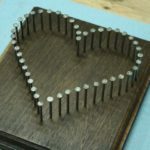 This is super easy, and all you need are some extra braces and a piece of wood to glue them to. Cut some braces that are the same size and thickness as the blanks you use on your acoustic guitar back plate. Then, glue them a couple inches apart from each other to a larger board. The only requirement for this larger board is that you can clamp it to your bench somehow. 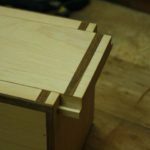 It doesn’t matter the size or the shape, as long as there’s enough room to glue down the braces and clamp the board to your bench top so that the clamps are not in the way of carving. At this point, you can now carve down these braces just like if they were on a real guitar. As you do, you will literally get to do the exact same process that you would on a real instrument, but in a completely consequence free way. If something happens, just move to the next brace and learn from your mistake. 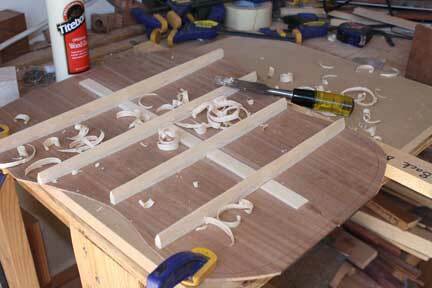 Carve all of the braces this way, and I recommend that you carve several at first to get the process down. Mostly it’s to alleviate your own fears so that way when you carve the actual braces on your guitar, you don’t make any unnecessary mistakes. 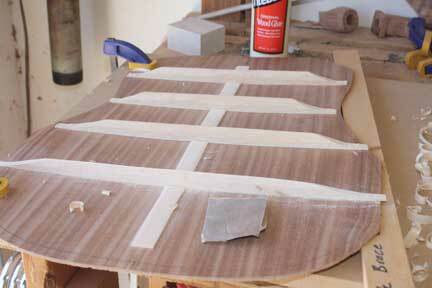 The biggest tip that I can give you for carving the guitar braces is to use a sharp chisel. One of the biggest letdown’s for edged tool users as beginners as they forget to sharpen, and feel like the tool is inferior. In reality, an edged tool is very good at removing material, it just needs to be very sharp in order to be effective. Beginners tend to use a tool without a very sharp edge, and then the edge gets worse over time. This can make you think the tool is inferior. Instead of falling for this trap, make sure that before you carve your braces you thoroughly sharpen your chisel. On top of that, keep your sharpening supplies close in case you need to hone the edge again in the middle of the process. A well sharpened chisel is amazing tool to use. You owe it to yourself to see how awesome it is to work with a very sharp tool, and you will be surprised when you see how easy carving the braces can be with a tool that is razor sharp. If you take an old beat up chisel to the your braces, you will not be happy with the results. You may even think that you are just a poor guitar maker, but that couldn’t be farther from the truth. A dull chisel will not get good results. Instead, make sure yours is sharpened really well. It’s a good idea in the beginning to apply a couple layers of painters masking tape around the sides of the braces. Place the tape flat against the back plate, and put it up right next to where the braces contact the plate. The point is to put a little bit of a protective layer on the back plate to help absorb the blow if you accidentally make contact with the chisel. It’s not going to stop very much because it’s only tape of course, but it can help avoid some of the little marks. If you don’t think you can control yourself with a chisel at all, then I recommend laying a piece of veneer or a thin piece of scrap wood on both sides of each brace before you carve it. This way if you do miss, you will damage the scrap board instead of your back plate. However, if you are patient enough and you know you are going to take your time to do it right, then don’t worry about the protection. Back braces don’t require a lot of downward force to carve them, so if you are being careful you should never strike the plate. 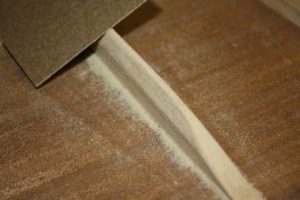 One of the biggest secrets to carving acoustic guitar braces is to take very shallow passes or light passes with your chisel. This is the opposite of what most beginners tend to do, and they mistakenly think they can hog off the entire cut in one pass. A chisel is a fitness tool, which is very unlike a force tool like a hammer. A chisel should be able to glide through a piece of wood and remove material by hand only, without the assistance of a hammer or a mallet to drive the tool through the wood. Think about that as you’re carving the braces. 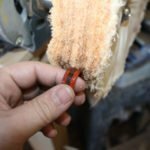 If you need to push so hard that you would rather use a mallet, then you are either taking off too much material at once, you need to sharpen your chisel, or it’s a combination of both. Shallow passes with a chisel will take more time initially then if you were to take really deep passes instead. However, you have a lot more control, and you’ll make a lot less mistakes. In the end, that will actually save you time instead of costing you time. Then passes also give you the ability to shape the braces very specifically. This means you have all of the control, and you can exactly carve the braces to the shape that you desire. This is a huge win, and all because of a minor adjustment in your chiseling style. Another great tip is to use the chisel with the bevel facing down. Most of the time the chisel is used with the bevel facing up. 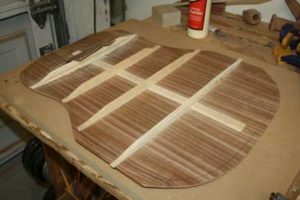 While this is good for a lot of applications, making a guitar is a little different because it’s a little bit harder to access all areas of the brace. With the bevel facing down, it moves the angle of attack upwards and the handle is now held at about a 45 degree angle to the board. This gives you much more unrestricted access to all parts of the brace that you’re carving. You no longer have to worry about the handle being in the way, and you no longer have to manipulate the tool very carefully to get it into a tight spot. 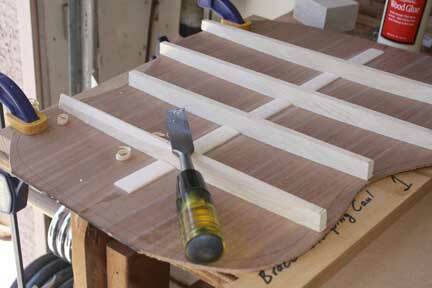 The tighter areas on the board are now very easy to access, and you will be able to carve much more cleanly. 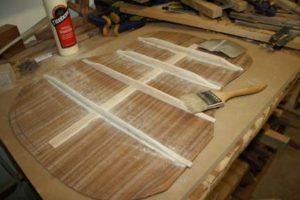 Once you start the carving process, it’s good to begin with the ends of the braces which are scalloped down very close to the board. I recommend that you follow your bracing plan, and measure for the beginning of the scallop. Make a mark where the scallop begins, and if you want to you can even draw the profile on the side of the brace to help you. Most of the time you won’t need this, because a scallop is a pretty easy shape to create with a chisel. However, as a beginner can be helpful. 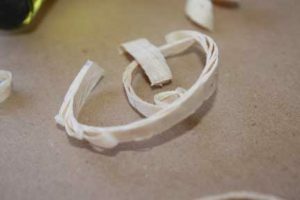 Work carefully to create the scalloped shape on the end of the brace. Don’t go too deeply too quickly, and again take very thin passes. Once you have the scallop created, take a look at it from several angles to make sure that it looks good. Scalloping all of the ends first is a good practice because the material on the top of the brace in those areas is completely removed. If you were to create the shape of the brace first, you would end up wasting time shaving the ends only to cut them off in the next step. Don’t do that, and instead scallop the ends first and then go back and create the overall shape of the brace. That’s coming up in the next section. Back braces are fairly simple, and they don’t need to have any type of elaborate shape in order for them to be structurally sound. All you need to do is create a parabolic shape or profile, and that’s really it. The parabolic shape is one of the strongest natural shapes. Enough material is removed that the braces lighten significantly, but none of the height is removed meaning that the brace retains the overwhelming majority of its original strength at its full size. Removing material from the side of the brace only very slightly affects the strength, so the parabolic shape is the absolute best that you can do. It’s also really easy to carve, because it’s a symmetrical shape and it runs entire length of the brace. 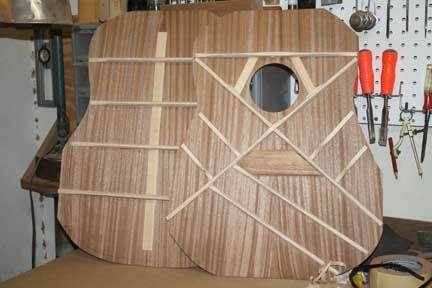 The backplate on the acoustic guitar is curved, so you won’t be able to clamp the entire thing flat to the bench when you are carving. That’s OK though, because all you have to do is clamp half of it down and work in sections. Clamp down 1/2 of the back plate, which would be the left or the right. 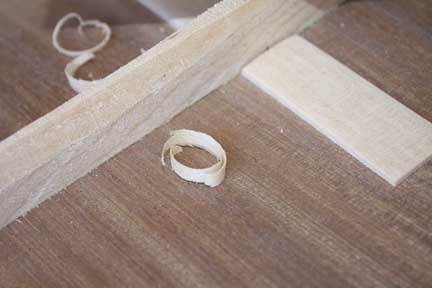 Use your chisel to carve the braces on this half first. Carve them all together, and when you’re satisfied with the work, you can flip the back plate and do the other side. The last thing you want is to try to force the black plate completely flat. This will negate all of the work that you previously did when you attached curved braces to the plate. 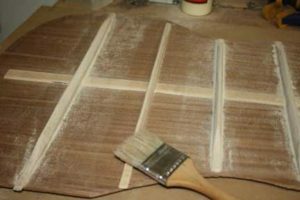 Instead, work in sections and you will not have to worry about damaging your acoustic guitar back. The easiest way to carve the back braces while carving half at a time is to work from the center to the ends. This will help, because the ends of the braces are open and it will allow your chisel to exit the material. When you work from the edges to the middle, it will tempt you to go over the center line and carve part of the board that’s in the air. This can be extremely dangerous, and it can cause cracks and fractures to your guitar back. Instead, work from the middle to the ends. All you need to do is clamp up the board in a way that you can chisel away from your body, and there are a number of different ways to do that. Find an acceptable clamping method, and make sure that you’re comfortable. Being comfortable, and carving in a way that allows you to maintain the integrity of the board are two very important elements. 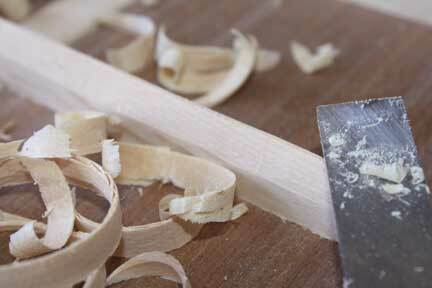 Take the time to get everything set up really well before you start carving, you’ll be very happy that you did. Tap toning is a mysterious skill that takes a very long time to develop. 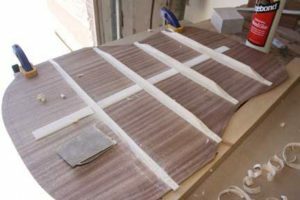 It’s more of a comparative skill, and it’s where you listen to the sound that a board makes as you change the size and as you remove material from the braces that are attached to it. 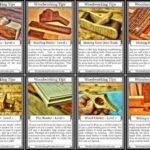 The only way to build up an information base on tap toning is to do it a lot. 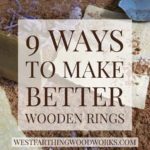 The more you tap the wood that you work with and listen to the tone it creates, the more you will start understanding what changes in bracing structure and thicknesses will do to a plate. Don’t think that you need to completely understand tap toning right out of the box. What you are doing is creating a database in your mind that you can compare with when you have other pieces of wood in the future. In order to effectively create this database, I recommend that you pick up your back plate very often and tap it during the carving procedure. Listen to the sound it makes, and tap it several times in order to understand and really hear that sound. You will hear changes as you carve your braces. This is completely normal. They may not be very abrupt or sound very big in the beginning, but they will help you establish your mental database on tap toning, and it will help you get better at this skill in the future. For now, don’t worry exactly about how the guitar plate sounds. Make sure that you’re tapping it and you’re listening to it. 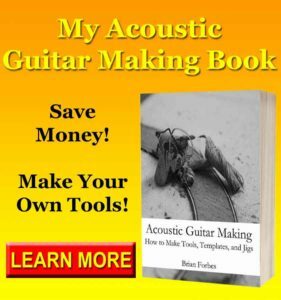 That’s really the more important thing at this point, especially as a beginning acoustic guitar maker. Once you’ve completely carved the braces, it’s time to break out the sandpaper. Yes these are internal races, and yes they are very hard to see from the outside of the guitar. However, you are a professional and your braces should be very smooth. Even if you are not a professional, and this guitar is going to be for your own personal use, you owe it to yourself to have a guitar that’s not built like crap. You are making a custom guitar, so have pride in your work. Start with 100 sandpaper and smooth away any flats or facets that are on the braces. Take your time, and work back-and-forth along the entire length. 100 grit sandpaper is pretty good at removing lots of material quickly, especially from the soft spruce braces. Work one brace at a time. Resist the urge to jump from brace to brace, because you will never see much progress being made that way. Instead, finish one brace completely and then move to the next. It may seem slower in the beginning, but you will actually be completing work. As you complete each brace and move to the next, you will see this accomplishment. 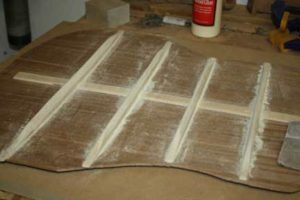 It will help you build momentum in sanding, which is typically one of the more boring woodworking activities that you need to do. Once you’re finished sanding, it’s time to inspect the back plate. This is a complete left to right, top to bottom inspection where you look at every single thing about the braces and the plate itself to make sure that it’s 100% correct. Go over every brace one at a time, and look very closely. Mark any areas that need to be gone over again with a light pencil mark, or use a piece of masking tape. Go over every single brace, and mark them all this way for sanding later. Also, if you made any marks on the back plate on accident, consider either filling them up or sanding them out. You should really do one of the two, and thankfully being on the inside it will be a little easier to hide them and then being on the outside. Once the back plate is fully inspected, go back and address all of the defects. After finishing the work, inspect it one more time. If you find nothing additional, then your work on carving the back braces on your acoustic guitar is finished. Now that the plates are done, we need something to attach them to. The sides are that something, and I’ll show you exactly how I prepare them. This part of the series is about the prep work, which you can do yourself. Sides are like any other kind of part. If you have a couple common woodworking tools, or you can get access to them at a store, you can mill the sides yourself. I’ll also show you a trick for getting the edges to be nice and straight for gluing as well. This trick alone is worth your time, because it means your pieces will sit in the mold better, and the plates will glue better. Flat surfaces are important, and you can make the edges perfect really easily. See you next week. 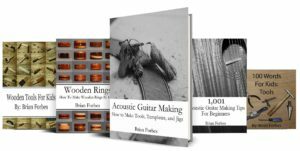 If you have any questions on How to Make an Acoustic Guitar Part Seven, please leave a comment and I will be glad to answer them. Happy building.